Time for a road trip in the desert for Mom’s birthday! First stop: Vegas. No, not for the gambling (I only lost $5, which incidentally is also the amount that I bet), and not for the showgirls. Partly for convenience to the places we wanted to drive, but mostly to see this. More on that later, though, as that happened on day two! We arrived late and rented a car. I begged very prettily for a car with an aux jack for the stereo, since I had carefully curated a lengthy playlist on my old iPhone and *needed* to make sure we had good music for the drive, particularly on long stretches of radio-limited desert highway. They very kindly gave us the one car type that would *definitely* have an aux jack…. a Prius. Hurrah for eco-friendliness, boo for driving excitement. Oh well, at least we’d have music! Then we checked into our hotel (boring chain, nothing to write home about) and headed out to find food. I naturally dragged us to a vegan metal bar in a deserted industrial area, because I like adventure and because the food looked tasty. Every city needs a proper vegan metal bar, and Vegas is no exception. 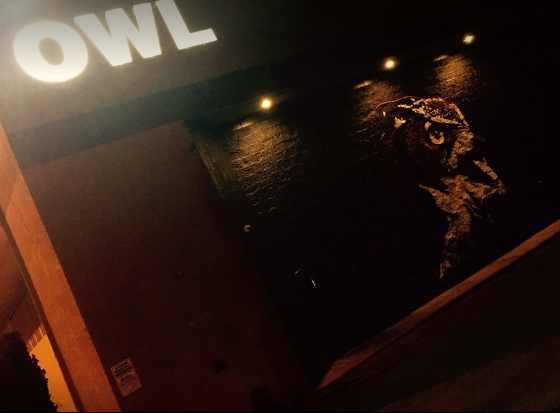 It’s new-ish, and called simply OWL. It has the word in giant letters on the side, and a huge owl mural, and that’s it. No windows, no obvious door, two cars in the parking lot… It might be the most uninviting bar I’ve even been to, from the outside, and the area is, as I said, deserted (it was nearly midnight at this point). The bar was deserted too, except for the staff and a couple regulars (who were possibly also staff), and the super-sweet resident rescue dog. It was dark, had lots of original artwork on the walls, the bartender was really nice, and I loved it. We had some fried pickles and sandwiches, and called it a night. The next day we walked across the freeway onto the Strip (reminder to self and note to others: Las Vegas is NOT a walkable city), and on to our main destination: Louis Vuitton. I mean, obviously, right? I needed some custom handmade luxury monogrammed trunks for our desert roadtrip, because this is definitely how I roll. Nah, just kidding. We were there to see the privately-held artwork *inside* Louis Vuitton. Akhob (Egyptian for “pure water”) is the largest Ganzfeld the artist has ever made. James Turrell is a light and space artist, one of my absolute favorites, and I’ve wanted to see this piece for awhile. It’s housed in Louis Vuitton because they commissioned the work and own it, and are apparently quite active in the arts (my respect for them increased quite a lot after this trip). The piece is free to visit, but by reservation only. Viewings are limited to four people at a time, and the process of getting in to see the art is an experience in itself. First you make an appointment (weeks in advance); then you show up a bit early and wander around Louis Vuitton looking at Very Expensive Luxury Items under the watchful eyes of suited clerks/security guards. Then you’re met by a friendly staff member who takes you, via private elevator, into an anteroom with a couple other staff. This room is dimly-lit, to prepare your eyes for the experience ahead. While your eyes adjust, they tell you a bit about the artist and the art, and then lead you into the larger room that contains the piece. You remove your shoes and put on foot coverings, to protect the floor of the work (the space must remain pure so that no flaws exist to catch your eye and give you something to focus on). Then you’re led up the stairs into the first chamber. You can wander around that small initial chamber, and/or enter the larger chamber beyond. Past that second chamber is a third, even larger space, but you can’t determine the boundaries of that one. One staff member stays near the entrance to assist in case you get disoriented, and the other stands at the lip of the precipice into the final chamber, to stop you falling in. Inside, the chambers are roughly spherical, and bathed in differently-hued lights. The whole viewing experience lasts roughly 20 minutes, and you’re free to wander around the space throughout. During this time, the lights in the three chambers gradually shift, changing color and intensity, sometimes contrasting, and sometimes melding together. As a result, looking toward the third chamber (the one you can’t enter and are protected from tumbling into accidentally) sometimes looks like you’re seeing a solid wall at the boundary of the second and third chambers, and other times looks as though you’re staring off into a limitless distance. Sometimes you feel like you’re floating in a cloud of light, expanding out into this endless space, and other times you feel corporeal and small, but bathed in light so physical that you should be able to touch it. Turrell is also a pilot, and I’m sure you’ve read about the famous sensation that pilots sometimes experience when flying in certain conditions (particularly over water or in dense fog) where because everything they can see is exactly the same color, they lose the ability to focus on a particular point, which makes it difficult to define their position and orientation in space. It can be extremely unsettling and dangerous, as pilots can lose track of which direction is up, panic, and crash, but Turrell finds it very peaceful, and wanted to share this experience with others through this work. It’s truly amazing, and I could have happily stayed there for hours. Photography isn’t allowed, and certainly can’t capture the experience but this article includes some lovely shots that will give you an idea of the space. Then we had brunch at Giada, which was exquisite. I had the sunrise polenta waffle, with fresh béchamel and maple syrup and sunny-side-up eggs. We also shared the mushrooms and the burrata, which came with the most delicious balsamic sea salt. It was pretty and friendly and the food was amazing. I’d go back in a second (though I couldn’t afford to visit often). As soon as we finished brunch (and after our 40-minute walk back to the hotel in 95-degree desert heat, which I chose to think of as a ‘conditioning hike’) we left Las Vegas, and headed on to our next adventure. That one will have to wait for the next post, though (also that’s the point in the trip when I remembered to take pictures, so things will get a little more interesting). Onward!